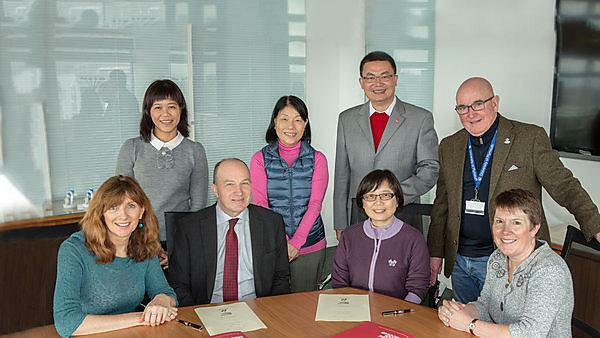 An agreement has been signed between the University of Plymouth and Kiang Wu Nursing College of Macau, which will see the two organisations working with each other to further the cause of dementia in the UK and China. The two organisations will work together on a number of projects, including exploring how assisted technology relating to dementia might help Macau in its quest to become a dementia-friendly community. There are plans for a joint conference on dementia to be held in Macau possibly in 2018 and an education project with nurses and doctors in Macau to share skills and knowledge. A two-way Visiting Scholar scheme will be introduced, as will exchange opportunities for students. Mirroring the University of Plymouth’s own world-leading activity around rural dementia, a project will be established to explore ways of tackling dementia in rural areas of Macau and China. In terms of research, collaborative research projects will build on existing work led by the University of Plymouth – such as the ground-breaking initiative to improve airport and airline experiences for those with hidden disabilities and which was taken on as a mandatory requirement for UK airports by the Civil Aviation Authority last year. There will also be a focus on patient-centred care research, with collaborations between Kiang Wu Nursing College and Plymouth University Peninsula Schools of Medicine and Dentistry.